Cody Hedlund won the Non-Pro Showdown in Cowtown on Meteles Cat. Hart Photography. It was a big win in more ways than one, for Cody Hedlund and Meteles Cat on Monday night, in the Non-Pro division of the inaugural Western Bloodstock NCHA Showdown in Cowtown. The 227-point score was Hedlund’s highest earned in a limited age event, and the winner’s purse of $35,000 hit a home run out of Will Rogers Coliseum. Steven Feiner and Lil Rattler placed second with 222 points to earn $22,000, while Kylie Rice and Master Mate scored 219 points for third and $20,000. The Showdown in Cowtown was a concept suggested to NCHA by Western Bloodstock Ltd.’s Jeremy Barwick, an innovator in cutting horse marketing and sales. Five-year-old Meteles Cat, by Metallic Cat, is now the earner of more than $220,000. In addition to his Breeders Invitational win, he also placed as non-pro reserve champion in the 2014 Breeders Invitational and NCHA Super Stakes, and won the PCCHA non-pro championship. 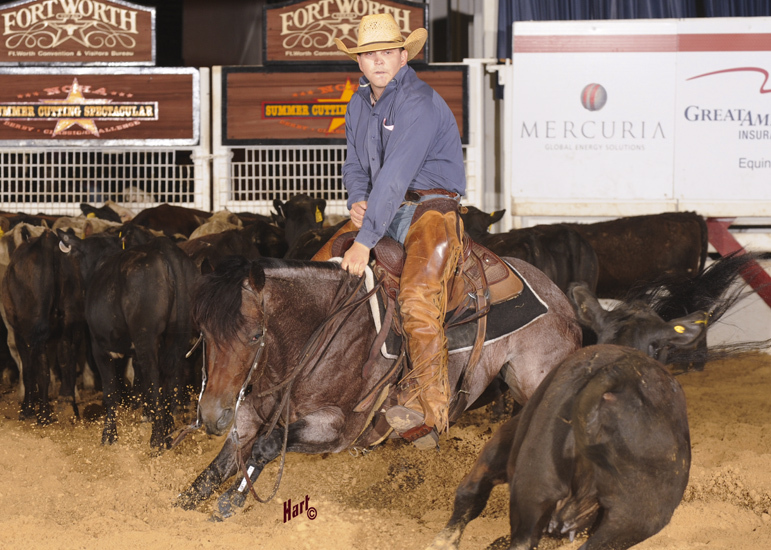 Six-year-old Lil Rattler, by Dual Rey out of 2005 NCHA Futurity champion Highbrow Supercat, also surpassed all of her previous non-pro earnings with her Showdown cache of $22,000. The lifetime earner of nearly $260,000, Lil Rattler’s biggest previous share of a purse came as fourth-placed open finalist in the 2013 NCHA Super Stakes, under Wesley Galyean. “I was getting kind of nervous and I don’t usually get too nervous,” said Cody Hedlund, who drew last to work in the 12-horse field of the Non-Pro Showdown in Cowtown finals, where Feiner and Lil Rattler drew next-to-last. “With Steven having that run right before me, I wanted to make sure I had an aggressive run and they (judges) knew I was here. Meteles Cat was bred and trained by Hedlund’s father, Rock, who qualified for this week’s NCHA Derby Open Semi-Finals with 434 points on Twice As Smoothe. Meteles Cat is also a half-brother, out of Teles Lies, to Teles Bout This Cat LTE $223,509, by WR This Cats Smart.